What did the lesbian bring on her second date? Well… if it is a 20-ft U-haul, you should RUN!! I called around, found the best deal. It seems a general policy that the 14-ft-ish trucks are the same price as the 17-ft-ish trucks. I went for the 17 – too much room is better than not enough, right?! Well, apparently my pick-up location was out of 17-footers, so I was upgraded to the neighborhood sized truck – the 20-ft U-haul. I thought I should have a special license to drive that thing! I almost put an ad on craigslist to see if anyone else wanted to move to Olympia. SO.BIG. Just a hint, in case you’re moving too… They offer better deals on the phone than they have online. And if you tell them, “so-and-so offered this much”, they’ll be likely to match the price. It’s like an Ugandan Market out there. I had eight friends helping me load and a friend from Bellingham who served as the official loading master of the monster truck. I had only one breakage – and that was due to what I’d call a poor box choice on my part. I’d say my friends and I did a more efficient job than a moving company! It was an economical move (~$125) with limited packing material waste. I did most of the packing myself, and fragile items were wrapped with clothing, or the limited supply of packing bubbles/bubble wrap I had on hand, all reused and most re-re-usable. 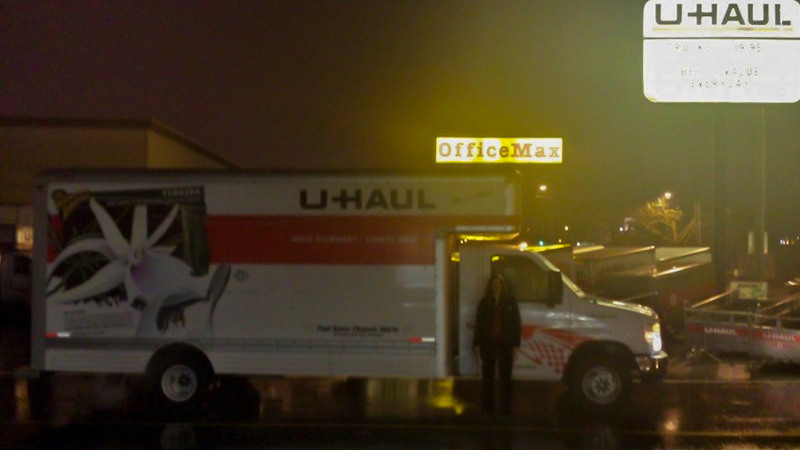 And let’s just say… well, I had some mad storage skills at my old place because that 20 ft U-haul truck was FULL! The boyz (my cats) are adjusting well. We did have an incident the second night where Maluco saw a light reflection in a window about 20 feet away, took a stance on the bed, growled, stood VERY still for a full minute plus, and then forcefully CHARGED under the sheets to the bottom of the bed. A true “scaredy cat” moment. The growling had me fooled. I may need a dog after all. I’m in the midst of finding places for items that filled a 20-foot U-haul (unbelievable) so I’m going to get back to it, but I wanted to be sure you didn’t think I took the truck and nested somewhere. Seriously… watch out for the lesbian with the U-haul!